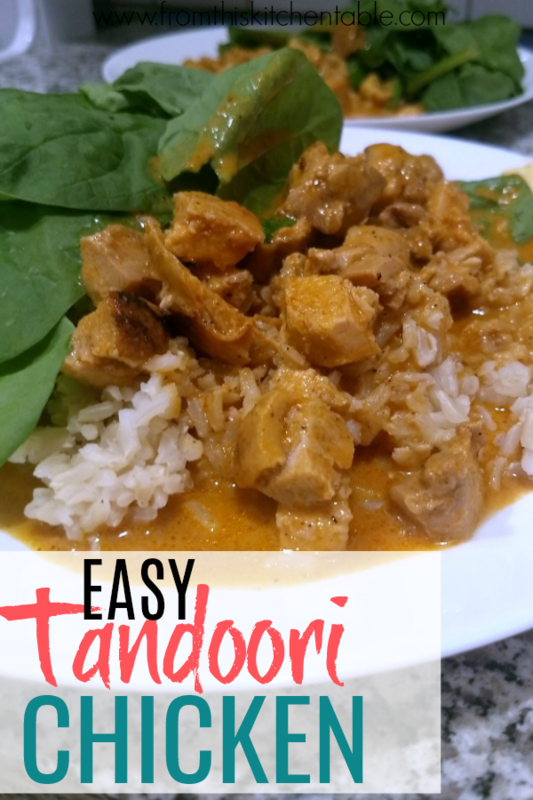 I’m all about fast, flavorful, healthy meals using real ingredients and this Easy Tandoori Chicken recipe is exactly that. I received an early copy of Lisa Leake’s newest cookbook, 100 Day of Real Food on a Budget, last week and am looking forward to trying several of the recipes. My daughter has the Costa Rica Red Beans recipe on her list to try next week. 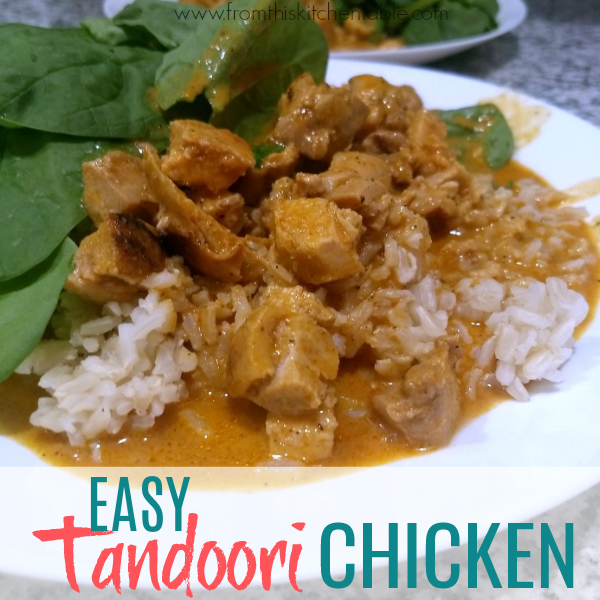 I am super excited to have permission to share this tasty easy tandoori chicken recipe with you. You guys, this recipe was so simple. It’s a 30 minute meal that’s full of flavor. Definitely great for a busy school night or a leisurely weekend dinner. All three of my kids cleaned their plates. Even my pickiest gave it a thumbs up. The 5 year old at first protested at the spinach, but once I tore it up and mixed it into his food he proclaimed it good. This easy tandoori chicken recipe is also one of those meals to have in your back pocket when your other dinner plans fall through. There are few simple spices (coriander, garlic powder, ginger, cumin, ginger, salt, and cayenne), coconut milk, tomato sauce, and rice from the pantry and chicken from the freezer. If you don’t have spinach, just add another family favorite vegetable and dinner is ready. In true Deanna fashion, I made a tiny change. Notice Lisa keeps the chicken in full pieces. My simple tweak is below. Budget Friendly Tip: Cut down on the chicken (I used 2 boneless thighs and 1 small breast) and after it finishes cooking remove from the sauce, cut into pieces, and add back to pan. You can also add cooked chickpeas or cooked, diced sweet potatoes to replace some of the chicken. Combine the garlic powder, coriander, cumin, ginger, salt, and cayenne in a small bowl. Put on one side of the chicken. Preheat large skillet over medium heat with the oil. Place chicken seasoned side down in the pan. Sprinkle remaining spices on the other side. Sear until golden brown - about 2-3 minutes per side. Add coconut milk and tomato sauce (and chickpeas or sweet potatoes if using), bring to a boil and cover with lid. Reduce heat to low and and cook until chicken is done all the way through, 8-10 minutes. If desired, remove chicken from pan, dice and stir back in. Add more cayenne if needed. Layer in bowls with brown rice on the bottom, then spinach, chicken and sauce mixture, and any accompaniments. 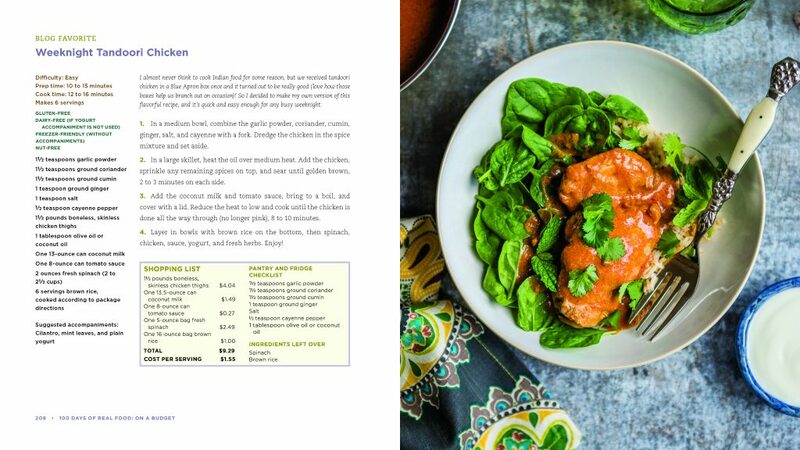 You can see the format for the cookbook above – that is how each page is laid out. Very simple, easy to understand, and I love the pictures. In the recipe cost breakdown, Lisa includes what it’s going to cost you to buy the entire product from the store, not just the portion you use. The first almost 50 pages of the book is food budgeting tips and resources. If you need ideas for that, I’m sure you’ll find it helpful. If you are already a pro at your grocery budget, most of the tips will be things you already implement. A lot of the recipes are ones we’ll try. Some I don’t think will fly high in my family, but over all, Lisa always has flavorful, healthy recipes. My grocery budget is a lot less than Lisa’s budget plan in this book. That means my budget can’t handle us eating a weeks worth of these recipes. But we don’t have too – I can incorporate a recipe here and there as I make my plan each week. Do you have any of Lisa’s cookbooks? What are your favorite recipes from them? I want to know which others I need to try! 100 Days of Real Food and 100 Days of Real Food Fast and Fabulous are her first books and this newest one is 100 Days of Real Food on a Budget. This entry was posted in Uncategorized on August 15, 2018 by Deanna Michaels. This looks great! I got a little overwhelmed by the ingredients list until I realized it was mostly spices. It really does look easy. I can’t wait to try it. Thanks for sharing! Yes! It really is super simple and came together quickly. I love Indian food. Thanks for stopping by. This looks so tasty!! I wish I have a serving in front of me right now! Thanks for sharing at Fiesta Friday party! Have a fab weekend! Thanks. 🙂 It is tasty. Have a great week! I love Tandoori Chicken! Thanks for bringing your dish to Fiesta Friday! It is so good!!! Thank you.